Employment Requirements for the welding field. Must be able to stand for 5-7 hours per day. As current welders are beginning to retire they're causing an anticipated shortage of about 200,000 skilled welders across the U.S. The baby boomer generations (people ages 50 and over) have occupied the majority of the welding jobs. There haven't been jobs available for younger generations to join this field until now. Younger generations have been directed away from the labor trades. Some employers and union members have reported finding it necessary to import skilled welders from other states to satisfy needs on large construction projects and expansion work in Northwest Indiana. Machinery and technology are not expected to replace humans for construction and industrial welding in this lifetime. Due to the nature of the work, construction and industrial welding is still a field that requires human welders. Machines and computers simply do not have the technology to be used in all the different locations and scenarios that humans can go to create welds. Technology hasn't advanced enough to be trusted in place of the human eye for critiques, corrections, and problems. Machinery and technology can be competition for humans in manufacturing, production and auto body welding jobs that use GMAW/mig welding. Employers in these fields still prefer to have a skilled welder oversee the use of machinery. This section is intended to explain the possible work opportunities CWC students can explore. This is not intended to advocate or promote any type of job. Joining a union- Either apply for an apprenticeship training program or gain employment with a company that has an active union. An apprenticeship is usually four years of a paid training program used for new union members to learn their job. Each union hall has their own application dates and criteria. The union chooses new members once a year. School's cannot place students into a union or assist selection in any major way. Certain unions prefer applicants with welding knowledge. Without welding knowledge, individuals have reported waiting 3-4 years before being offered an apprenticeship position or giving up. Welding knowledge typically reduces that time significantly. Below are links to information about four popular union halls in our area, and details about our understanding of their welding preferences. Selection Process Information: Applicants are chosen based off results for an aptitude test and interview process. Local 597 receives nearly 2000 applicants for about 150 apprentice spots. A welding background can make an applicant more appealing. Selection Process Information: This union is interested in SMAW/stick plate certifications. Selection Process Information: This union is interested in welding preformed on thin material. There are plenty of welding opportunities that do not require a union membership to start. Structural and Pressure Vessel welding are typically done in industrial and construction settings. Employment examples include: railroad repair, steel fabrication, tank repair, engineering shops and traveling construction jobs. These types of jobs are usually preformed in the GMAW/mig welding process. It is fairly easy to gain employment in these fields because there are so many of these jobs available. The salaries are usually a lot lower then Structural and Pressure Vessel welding salaries. Welding on automotive parts has a lot of 'cool factor' and is usually done in GMAW/mig or GTAW/tig welding. The salaries typically don't measure up to the investment in training. Training for welding is one of the best environments you will face as welders. Welding in the field is a lot dirtier, more dangerous, and can be outdoors in the elements. Alternatives careers serve as a great back up plan for people who enjoy welding, but hate working in the field. High demand by large companies with an internal weld training department. Better work environment than construction and industrial work. Job requires a well developed skill set but typically pays less than construction and industrial work. Requires specialty training in a deep sea environment at a coastal school. Welding above water is COMPLETELY different that underwater deep sea welding. This field has its own certification criterion that does not require the ability to weld. Inspectors focus on taking x-rays of a weld and ultrasonically exam a weld for flaws and defects. *Note: These welding careers represent only a portion of the career choices available in the welding industry. 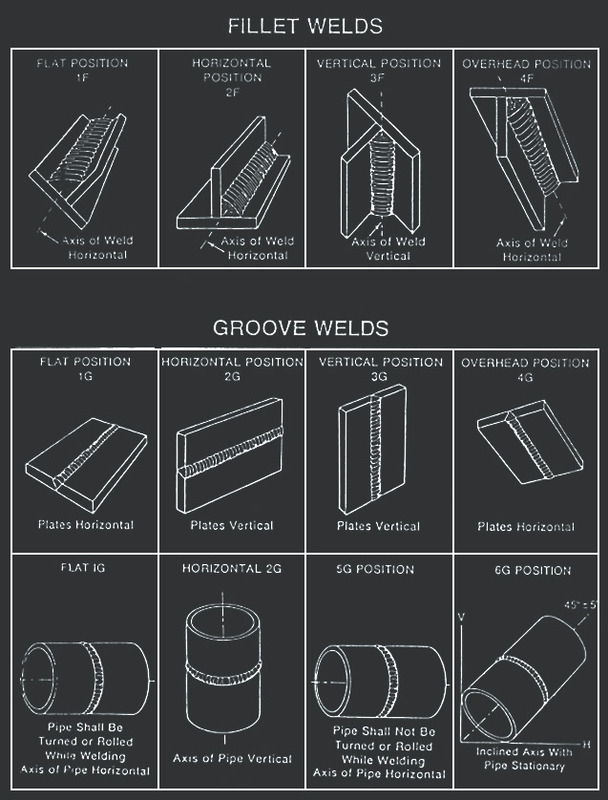 These descriptions are only intended to provide useful information to assist those interested in a career in welding. Different welding processes lead to different types of jobs. Different welding processes DO NOT mean different skill levels of welding. The more welding processes a person knows, the more employable they are. Welding processes each have several names. People are more familiar with the short term, such as ï¿½Stick welding', which is short for Shielded Metal Arc Welding, or the acronym SMAW. SMAW is the codebook and certification term. Below, are the interchangeable names of the four welding processes taught are our school. This will help you find the process you're looking for in the descriptions that follow. Mig welding jobs are numerous and are fairly easy to obtain. This process has a reputation of leading to high paying jobs and being in high demand. However, employers seeking tig welders will not be interested in recently trained welders and require 3-5 years experience. Used in high-end nuclear field, food grade work, engineering facilities, or low-end auto work or repair welding. A welding certification is required by all construction codes to weld. To become certified, a welder must pass a welder qualification test in the presence of a qualified witness. The welder qualification test examines the weld joint in using national welding code standards. Welding qualification tests are usually given in pre employment screening. When an employer requests a candidate be a certified welder, typically they are indicating that a candidate needs to have passed a certification test at some point. Once employed, a welder will take certification tests for every type of weld the employers expects them to perform. Certifications are non transferable. There are 100's of possible certification tests. Certifications vary by: Processes, Positions, Sizes, materials, certification standard, and quality test method. Most certifications are through an employer. When a person takes a welder qualification test without involving an employer, the certification is known as a personal certification. Certifications use national standards. There is no such thing as a state certified welder. An example of a national certification standard is the American Welding Society. Calumet Testing Services charges about $200 ï¿½ $400 per certification test. Employers typically pay for certification tests. Some welders prefer to have one or two personal certifications to offer proof of their ability to pass an employer's certification test when seeking employment. Employer certifications do not expire as long as the qualified weld is performed at least one time every six months. Personal certifications expire every 6 months. To renew certification, a viable witness is required to verify the performance of the certified weld prior to expiration. If a personal certification is allowed to expired, the welder will be required to completely retest.